In its first four games, the Ball State football team took on some tough teams including nationally-ranked Texas A&M and Northwestern. It won't get any easier when the Cardinals host the Toledo Rockets in a Mid-American Conference tilt at Scheumann Stadium for Ball State's Homecoming weekend. The Rockets are just outside the nation's top-25 after a 3-0 start and wins over Arkansas and Iowa State. 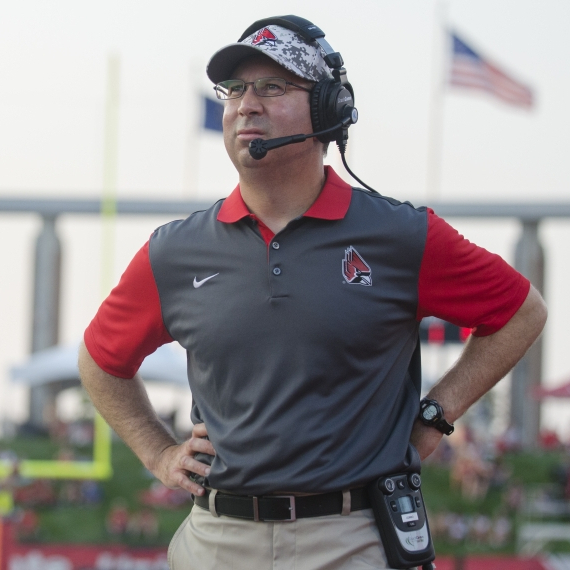 Ball State is the only team in the MAC with a league win, but head coach Pete Lembo knows it will be difficult to get the second on Saturday. The Rockets have made headlines to start the season. After two close games, they defeated Arkansas State 37-7 while forcing the Red Wolves into -14 yards on the ground. Toledo is only allowing just under 100 yards per game on the ground this year. Their success on the defensive front sets up an intriguing matchup with the Ball State running game. A three-headed attack led by sophomore Darian Green has the Cardinals averaging over 230 yards per game on the ground. Ball State put up 181 rushing yards the previous week against No. 17 Northwestern, but missed opportunities cost the Cardinals the game. Freshman Riley Neal took over the offense in the second half of the game against Eastern Michigan on Sept. 19 and hasn't looked back since. His ability with his arms and legs sparked the offense and gave Ball State a more balanced attack. Toledo will be looking to get after the signal-caller, but Neal is fine with being thrown in against a tough defense. Like Northwestern, Toledo relies on its defense to control the pace of the game and get the ball back for its offense. The Rockets have four interceptions on the season and have forced several fumbles. On the other side, Ball State will look to stop dynamic running back Kareem Hunt. He rushed for 129 yards in the team's game against Iowa State, but missed a week with a hamstring injury. If he can't play, the Rockets will look to Damion James-Moore to carry the load on the ground. Quarterback Phillip Ely has played well enough this season after winning the job in the preseason. Ely has thrown for two touchdowns and two interceptions to go along with 227.7 yards per game. He looks to exploit a vulnerable Cardinals' secondary that was just shredded by Northwestern's Clayton Thorson. Ball State (2-2, 1-0) looks to improve to 2-0 at home after a three-game road trip. A win would keep them atop the MAC standings and put the team back over .500 on the season. In a game with big conference implications, senior wide receiver Jordan Williams said he's glad to be back home. The Cardinals and Rockets will kick off at 3 p.m. on Oct. 3.